Open: The last Sunday of every month from 2:00pm-4:00pm. The Carlstadt Historical Firehouse Museum is run by the Carlstadt Historical Society houses a remarkable collection that includes archival photographs, written documents, new articles, clothing and other items that bring the borough’s colorful history to life. You can find everything from 1930’s era school pennants to early 20th Century fife and drum corp uniforms to a vintage breathalyzer used by the police department. The first floor of the museum is dedicated to the War effort with memorabilia from residents who fought in WWI and WWII, articles from both the Carlstadt Police and Fire Department, pieces of artwork from buildings around the town and mementos from residents of the town. The second floor is dedicated to the school district with pennants from school graduations and parties (Carlstadt is home to the oldest continuing school picnic in the county), pictures of classes of the schools (I even found my aunt and uncles pictures from when they attended school here) and high school yearbooks. If you are an alumnus of the school system, you will get a kick out of the second floor of the museum. Not only does it have the school archives but lots of pictures that were donated by alumni of the schools of their experiences. Years of school pennants line the ceiling. The museum can be seen in one afternoon but you will spend more time just looking at all the pictures and getting lost in the experience. Disclaimer: Some of the information was taken from the Bergen County Historical Society and some from my recent to the museum. The museum is open only on the 4th Sunday of each month and by appointment only so you need to plan accordingly. The Lyndhurst Historical Society is an interesting look into the early history of both the town of Lyndhurst, NJ and Bergen County. The museum shows how we moved from the agricultural era to the modern era in just one generation. The growth of the county really accelerated after the Civil War into the 1920’s. The building itself is built on the original 1804 school house that was torn down for the newer one built in 1893. The unique part of the museum’s history is that the building was used as a school house for third graders in the town until 1980. The museum is a treasure trove of memorabilia from the town’s past. One part of the museum is set up as an early school room with desks, blackboards and a whole teacher’s work area while the other side of the display is a nurses office for the kids. What is unique about the museum is that the original bell to call the children for school is still located on the top of the building and the bell can be accessed by the string in the coat room. They even let you ring the original school bell that has been in place all this time. The original built in chalk boards exist with artwork that had been left on them from the 20’s that have now been preserved. The other side of the floor plan is items from the 100th Anniversary of Lyndhurst that happened last year. The displays are related to the celebration with displays on businesses that have been in town for many years, Indian relics that were found in the town and memorabilia. Even the basement bathrooms are from the 1920’s and still work! The Lyndhurst Historical Society is a private, non-profit organization dedicated to the preservation of local historic sites and the promotion of community pride in our history and traditions. In 1984, a group of local citizens formed the Lyndhurst Historical Society. One of the Society’s early projects was to restore the “Little Red Schoolhouse” on Riverside Avenue and establish a museum in the schoolhouse for the exhibition of local history memorabilia. With community support as well as county and state grants, the Society’s goal to open the Schoolhouse Museum to the public was achieved in 1993. *plan and present educational programs and workshops of historical interest. *raise funds to meet the goals of the organization. *anyone wishing to volunteer time. *offers of financial support (all memberships and donations are tax deductible in accordance with IRS regulations). A one room schoolhouse crowned by a bell, symbolizes a simpler time, 19th and early 20th century America. In 1804, Jacob Van Winkle presented a strip of land to the school trustees for the construction of River Road School (“The Little Red Schoolhouse”). The yearly rent was one peppercorn if demanded. Thus was born the first known public school system of southern Bergen County. A subsequent building was erected in 1849. In 1893, the present school was built and used for classes until 1980. The Township purchased the school in 1984. It was leased to the Lyndhurst Historical Society in order to preserve this landmark, now more than a century old, for future generations to appreciate and to use as a local museum. The Little Red Schoolhouse is one of three historic sites in Lyndhurst. Just south of the Schoolhouse is the Jeremiah Yearance House, circa 1841. Years ago, teachers assigned to the School often boarded at the Yearance House during the week because the commute by train to their permanent homes would be too long. One block north of the Schoolhouse is the Jacob Van Winkle House, built in 1797. Van Winkle presented the property for the Schoolhouse in 1804. River Road School is joined by the Van Winkle and Yearance Houses on both the National and New Jersey registries of historic places. *Lyndhurst was once called Achter Kol? *The town has three sites on both the New Jersey and National Historic Sites Registry? *January 9, 2004 marked the 200th anniversary of the deeding of the land to the school house? *Lewandowski Commons is named for the brothers killed in World War II? *Palazzo Corner, built in 1905 and located at 262 Ridge Road, was used as the town’s first police state and court clerk’s office? *The Jacob Van Winkle House, now the Masonic Club is the oldest building in Lyndhurst? The museum is located on the corner of Fern and Riverside Avenue, is open to the general public on the fourth Sundays of each month from 2:00pm to 4:00pm. Group tours can be arranged at any time by reservation for schools, organizations and individuals. A visit includes a tour of the Schoolhouse, its exhibits and a presentation of local history by one of the Society’s docents. Call (201) 804-2513 for further information on museum tours and special events. Disclaimer: The second part of the this information was taken directly from the Lyndhurst Historical Society’s pamphlet. The Little Red Schoolhouse is open from 2:00pm-4:00pm on the last Sunday of each month or by appointment only. Please plan accordingly. The Belskie Museum of Art & Science Inc. The Belskie Museum, a tax exempt non-profit corporation, was founded in Closter, New Jersey in 1993 to save, restore and exhibit the works of Abram Belskie (1907-1988), one of our country’s most accomplished sculptors and one of the most eminent medical illustrators of our times. Mr. Belskie was a resident of Closter his entire adult life. The museum’s 3,900 square feet modern building was built entirely by the Closter Lions Club and donated to the Borough of Closter upon its completion in 1994. In addition to housing the many works of Abram Belskie, the museum also hosts monthly art exhibits by local, national and international artists and as a result, has become one of Bergen County’s leading forum for the arts. Past exhibitors include the estate of world famous photographer Andre Kertesz and Italian painter/sculptors Emilio & Ugo Baracco. A featured exhibit of photography in March 2003 was by Academy Award and Tony Award winning actress Ellen Burstyn. The museum also hosts exhibits from the local schools and colleges and many local artists. The museum is operated entirely by volunteers under the direction of a six-member Board of Directors (also entirely volunteer) appointed by the Borough of Closter, The Closter Lions Club and the Closter Public Library Trustees. Funding is from grants, memberships, fundraising exhibitions and donors. The museum has new art, history and science exhibits throughout the year. Open on Saturdays, Sundays and by appointment. Disclaimer: This information was taken directly from The Belskie Museum of Art & Science Inc. pamphlet. Please call the above number or email them for more information of hours of operation. The museum does change their exhibitions almost every month. Located on Pomander Walk Road near the Hackensack River, this land was in use as a burial ground by the Native Americans prior to the arrival of the European settlers. This site might have been used for hundreds of years as a burial site for the Native peoples. African slaves, who worked the farmland of the early European settlers, like the Zabriskie’s who owned the 125 acre farm that surrounded it, were subsequently buried at this location as were some of the early settlers. In 1663, the great elder, Oratam, was the Chief Sachem for the Ackingsacks, who lived along the Hackensack River. Oratam promised to give Sarah Kiersted a parcel of land between the Hackensack River and Overpeck’s Creek called “Neck of Land”. It consisted of 2,260 acres which included Teaneck, Bogota and Ridgefield Park. The original patent was dated October 21, 1667. On March 25, 1685, the East Jersey Proprietors conveyed 183 acres of this patent, located on the Hackensack River in what is now Teaneck, to Albert Sabboresco (Zabriskie) of Bergen, a planter/farmer. Albert Zabriskie, his descendant and later Henry Kip, owned the enslaved African American men, who were used to work the farmland and build the early colonial sandstone houses. Even though slavery was outlawed in 1804, the last slaves were not freed until 1865 making New Jersey the last of the Northern States to abolish slavery. To prevent the loss of this sacred ground, the ‘Coalition to Preserve Teaneck’s Native American/African Slave/Settler Cemetery’, was organized. With the Coalition’s encouragement, in 2006 Teaneck bought this open parcel of land on the banks of the Hackensack River. It can be visited during daylight hours and is designated with a Blue Historic Marker erected by the town of Teaneck, NJ. The historic Zabriskie-Kip Farmhouse (now a private residence) is located around the corner from the site on a buff on River Road facing the Hackensack River. Disclaimer: This information was taken directly from the handout from the Bergen County Division of Cultural and Historic Affairs. There is no fee for this site but be warned, there is not much to see. There will be plantings and a small memorial is being planned. On an oxbow in the northern reaches of the Hackensack River is Oradell’s Van Buskirk Island, a man made island that did not exist until 1802. Created by the dams built for the local mills, this stretch of the Hackensack River was the highest point of navigable water on the river where schooners regularly carried goods to and from New York. Now a part of the Bergen County Parks system, this almost 14 acre site contains the historic Romanesque brick buildings of the Hackensack Water Works. This is the oldest surviving representative of a water purification and delivery system from the late 19th and early 20th century period, crucial to the development of a modern, safe water supply that was critical to turn of the century metropolitan and suburban growth. The Hackensack Water Works, in continuous operation from 1882 to 1990 is a rare example of later 19th and early 20th century water works architecture and engineering. The historic buildings include the 1882 Pumping Station, expanding five times from 1886-1911 and innovative 1905 Filtration House, expanded in 1912 and 1955. The Pumping Station contains a unique collection of steam pumping equipment representing over four decades of development of steam technology in the early 20th century, including a 1911 Allis Chalmers Vertical Triple Expansion Pump and a 1915 Allis Chalmers Centrifugal Pump. The plant also contains the 1905 coagulation basin and gatehouse and the 1911 intake and waste gates. This Bergen County Historic Site with its open space and park like setting is a living 100 year old timeline of technology from steam to electricity as well as a river site that represents the evolution of Bergen County from its pre-Revolutionary War saw and grist mills to the creation of pioneering water filtration technology so vital to the 20th Century development of towns and cities all over America. Not open to the public at this time. The Bergen County Division of Cultural & Historic Affairs received an operating support grant from the New Jersey Historical Commission, a division of the Department of State. Disclaimer: This information was taken directly from the Bergen County Division of Cultural and Historic Affairs handout. Please call the above number or email them for more information. The Meadowlands Museum is the main steward of the history and culture of the Meadowlands region and one of its leading storyteller. Its mission and collection, which resides in the Yereance-Berry House in southern Bergen County in Rutherford, NJ are distinctive and unique. The house too is a historic treasure and landmark and was built in 1804 by the Berry family, who were among the county’s earliest European settlers. Rooms in the three-level American Dutch farmhouse are alive with permanent and temporary exhibits and sometimes include loaned objects from other museums and private collections. Historical artifacts like archives and photographs are mingled with textiles, furniture, housewares and artwork. There is even correspondence by the daughters of John Rutherfurd, a close confidant of George Washington. Grounds include the William Carlos Williams Poetry Garden, which acknowledges the legacy of Rutherford’s most famous native and the town’s history as a cultural center. Founder in 1961 as the Rutherford Junior Museum by parents of school age children to help connect them to their community, the museum is staffed by professionals assisted by dedicated volunteers and involved trustees. Interns add to the rich resource of individuals who contribute to its present and future. The location of the Yereance-Berry House suggests a colonial farm dating to 1740. The oldest house in south Bergen County in close to original condition, it was part of the Historic American Building Survey project of the 1930’s. The building is also listed on the state and national registers of historic places and the Bergen County Stone House Survey. Affiliated organization include the American Alliance of Museums, American Association for State and Local History, Meadowlands Regional Chamber of Commerce, New Jersey Association of Museums and The National Trust for Historic Preservation. Free and reasonably priced services for individuals, community groups, businesses, government bodies and educational institutions are available. *Educational programs, lectures and traveling exhibits. *Customized on and off site programs. *Collaborative ventures with a wide range of partners. *Assistance with academic research and other archival support. Special events, which often are made possible by partnerships with businesses and other organizations, are an additional way for visitors of all ages to enjoy the museum. Public and private events occur on a regular or one-time basis; many are fundraisers. Call or email for a current calendar and sponsorship possibilities. The house hosts both permanent and special exhibits. *Pre-electric kitchen: This unique kitchen in the basement shows off the collection of equipment that would be used in the kitchen from the Civil War to the 1950’s. There are coffee grinders, whisks, wash boards and such. It showed how much effort was put into preparing the family meal through the ages. *Meadowlands Geology: there are all sorts of rocks and gems not just from the area but all over the state. There are two different rooms one of the specimens locally and there is a separate room for glowing stones. It is very interesting to see when the lights are out. *Mining in South Bergen: This is how the county has changed when we mined ore.
*19th century Laundry Room: The Laundry room that is located in the basement has many of the things our grandparents would have used. The washboards, scrub bushes, old washing machines and ringers. Washing clothes was much harder back then. 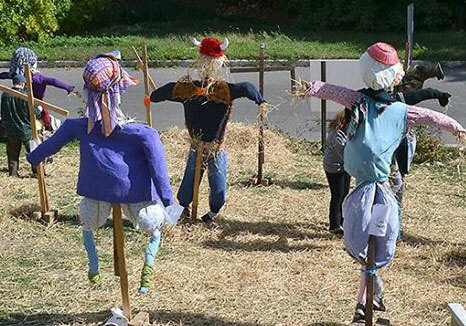 I went to the recent Scarecrow Day on October 20, 2018 where guests of the museum created their own scarecrows using their own creativity. All the scarecrows were lined up facing the street with their interesting clothes and accessories. Each person got to use their own clothes and each one had its own style to it. Scarecrow Day in Rutherford, NJ. I also stopped by for the Dutch Christmas decorations. The museum was decorated for the holidays with garland and trees. On December 1st, they had a Dutch Christmas festival (I could not attend) with food and entertainment. Individuals who value the purpose and work of the Meadowlands Museum remain its inspiration and abiding spirit. Donations, memberships, sponsorship’s, grants and fundraisers are crucial elements of the museum’s financial well-being. Admission to the museum is free but donations are greatly appreciated. Fees for events and other services vary. A personal letter to the appropriate person acknowledges a gift made in the name of an individual. Donations to provide for the buildings and grounds are valuable links to the future and a kind of giving that is among the museum’s top priorities. Disclaimer: This information was taken directly from the Meadowlands Museum’s pamphlet. For information on the site, please call or email the museum for more information.